Even though September has been quite the sunny month in Belgium, I've been already preparing for autumn. Autumn is quite possibly my favourite season. I love the warm autumn colours and adore walks through the forest when the trees turn different hues of yellow, red, pink & brown. 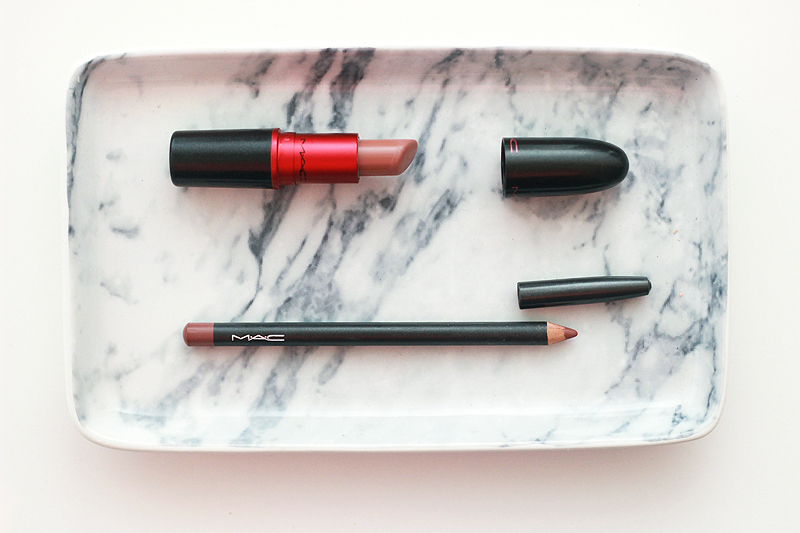 It's also the perfect season to go all out with warm, smokey makeup and brown tinted lipsticks. Not that I don't wear this look during the other seasons.. But it just matches even better now. 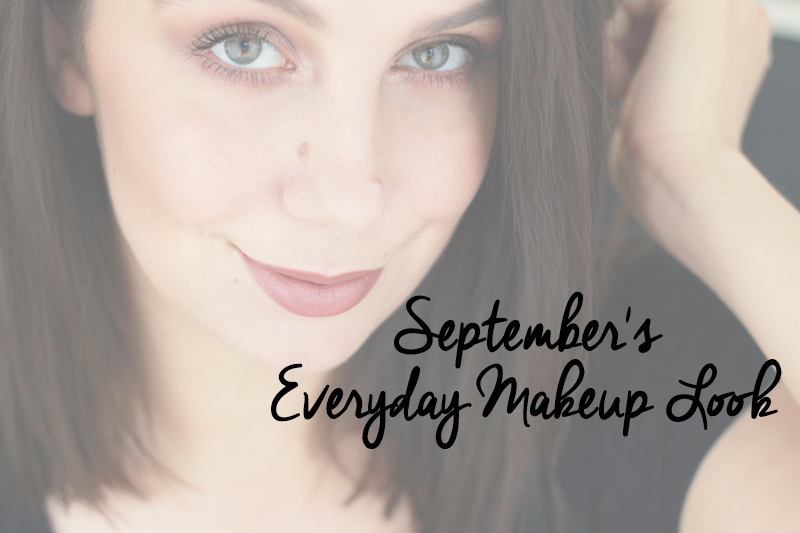 Here's what I've been using during the month of September! On my complexion I used the new Estée Lauder Genuine Glow Priming Moisture Balm. I like using moisturising primers when the weather gets a little colder. This one doesn't contain any pearl, but it is quite siliconey so it will smooth out some complexion imperfections and give you a nice base to work with. Not pictured here but also great in the same range is the Estée Lauder Genuine Glow Priming Moisture Eye Balm. My under eye area definitely has diva tendencies sometimes and this moisturises and smoothes the area perfectly before applying concealer. I think this might be great during winter as well when my under eye area gets a little dry. 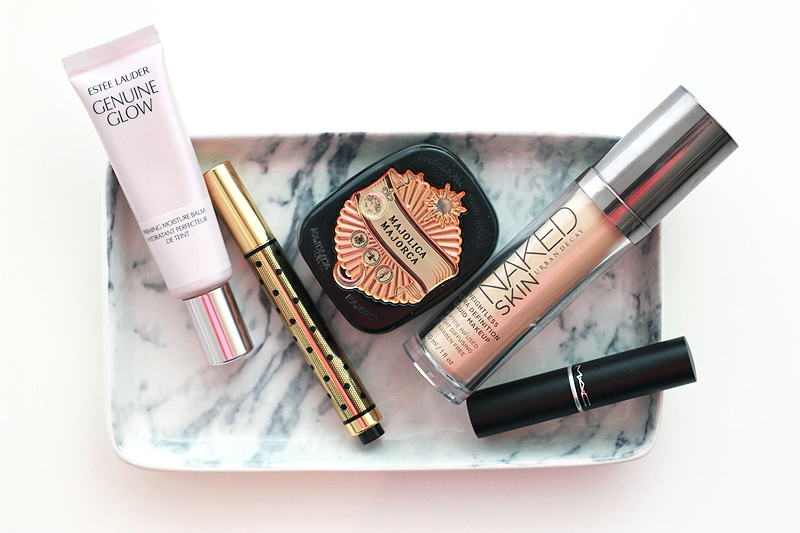 Base-wise I used my new Urban Decay Naked Skin Weightless Ultra Definition Liquid Makeup foundation. I usually swear by NARS' All Day Luminous Weightless foundation (read review here), but since it's not available in Belgium and it doesn't cost enough to qualify for free shipping on the NARS website I decided to give this one by Urban Decay a go. It has the same consistency, although it dries much faster and has a little less coverage from the first go. The coverage is buildable though and it also seems to last all day. I have been getting a few breakouts lately, so I still need to monitor whether this might be the culprit. I hope not! As a concealer I've been using the MAC Cosmetics Matchmaster Concealer again: it's not too heavy, doesn't cake up and gives nice coverage. For added glow I use the Yves Saint Laurent Touche Eclat wherever needed - I will admit that I sometimes also like to use it under the eyes. I'm not super happy with the face powders I have laying around, but I've been using up my Majolica Majorca Pressed Pore Cover Powder. It's translucent so doesn't give any coverage, although it does set my makeup. I find it a little drying though, so I'm on the lookout for something else. On my cheeks I've been loving thoroughly loving this combination. First I go in with my MAC Cosmetics Sculpting Powder in Sculpt (pictured in the Disney Maleficent edition) to contour my cheekbones. It's a beautiful soft and easily blendable cool matte taupe/brown powder that works perfectly for adding some depth to fair skin tones. It doesn't look muddy and isn't too orange - a good sculpting powder can be hard to find but I've found it with MAC. 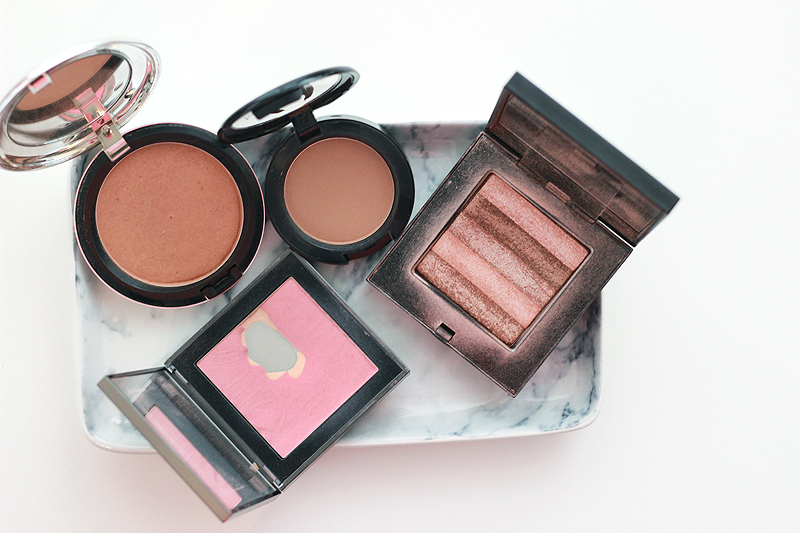 Then I warm up my face with bronzer: on top of the contour (I like a heavy cheek) and lightly dusted on my forehead & temples, my jawline and neck & wherever else I need some warmth. I have fair skin so I need something that doesn't make me look like an oompa loompa: I want a natural glow. This summer I got this MAC Cosmetics Bronzing Powder in the shade Golden from the Brooke Candy collection and it's just about perfect. There's a slight shimmer in the powder, which is just slightly noticeable when you apply it. I felt a little bad talking about this powder only now as the collection dates from this summer, but good news: it's still available on the MAC Cosmetics webshop when you browse all the bronzers! Continuing with blush I have a few I like and choose one depending on my mood. This time I went for Burberry's Runway Palette blush from last year's Spring collection (see review here). To finish with some extra glow on my nose bridge & on the high points of my cheeks, I go in very lightly with Bobbi Brown's Shimmer Brick in Pink Quartz. I don't like highlighters that are too cool toned, and this soft warm toned pink is perfect for me! On the eyes I've been trying to introduce some newbies, although it's quite hard as I've really figured out a top performing team now. I love the MAC Cosmetics Paint Pot in Groundwork: it's the perfect base for a warm eye look, although I've also worn it on its own whenever I'm rushing in the morning. It's long-lasting, still super creamy even though I've nearly finished the whole pot & provides a great base for eyeshadows. In my crease I like to use MAC Cosmetics Eyeshadow in Haux, a beautiful muted rosey brown shade that is just perfect: the very favourite eyeshadow shade that I own. It works perfectly with a warm brown base and really brings out my green eyes. I also use this under my lower lash line and smudge it out generously. On my brow bone I use a bit of MAC Cosmetics Eyeshadow in Vanilla - not to highlight, but just to even out the area. In the inner corner of my eyes I use MAC Cosmetics Eyeshadow in Naked Lunch to highlight (not pictured, my bad!). On my lashes I've been trying out L'Oréal's new False Lash Wings Butterfly Sculpt mascara and this one I really, really like! Mascaras are a serious hit or miss kind of product - I sometimes throw away a new release after just one use because I just can't deal with clumpy messes, but this one does a great job! The brush gets really close to the roots of my lashes and distributes the ink-black mascara evenly, which results in long and accentuated lashes. 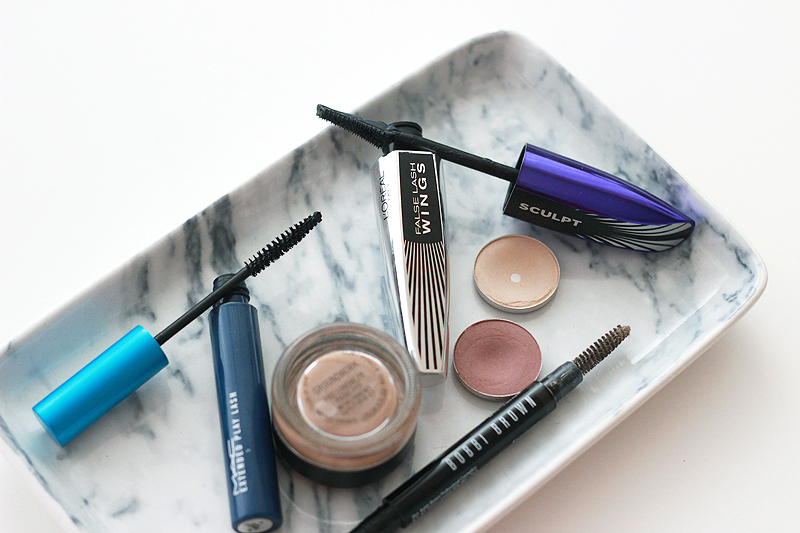 I love bold lashes & definitely give this one my seal of approval! On my bottom lashes I still use MAC Cosmetics Extended Play Lash mascara because the brush works perfectly in that area and the formula is water proof, though I really need to replace this one now and have been thinking about giving that mini Clinique mascara that is created especially for the bottom lashes a try. 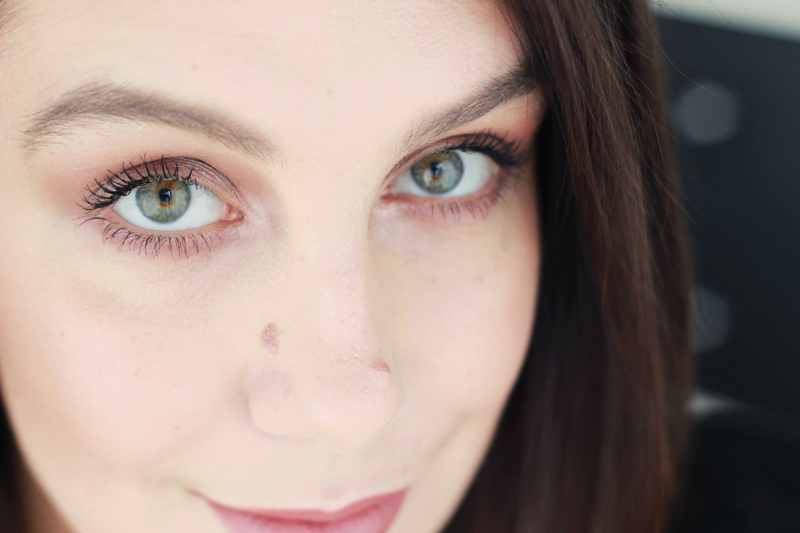 For my brows I've fallen head over heels in love with Bobbi Brown's Perfectly Defined Long-Wear Brow Pencil. It's a pricey product, but it's definitely worth it and I will definitely repurchase. The slanted pencil has enough pigmentation to easily define your brows, while it still is soft enough to make it easy for brow shaping amateurs like I am. I've also been growing out my brows the past few months in an attempt to finally have fuller brows, so I need a good product to cover up the sparse areas. I don't have the patience or skills to carve out my brows with a billion products in the morning to make them look Instagram perfect, but this pencil gives me the defined, natural result I'm looking for in about a minute. And that's all I want and need! On my lips I have been using mostly muted pink/brown lip products lately.. I just can't help myself! For this look I used the MAC Cosmetics Lip Pencil in Whirl and the MAC Cosmetics lipstick in Viva Glam II. Even though the lipstick has a satin finish, I find that when used together this combo makes for a comfortably matte look. I've been switching between a bunch of different MAC lipsticks in the same colour range - I will try and do a post with good swatches and combination recommendations soon. I know this might seem like an extensive line-up to some of you, and others will say that I kept it quite contained. 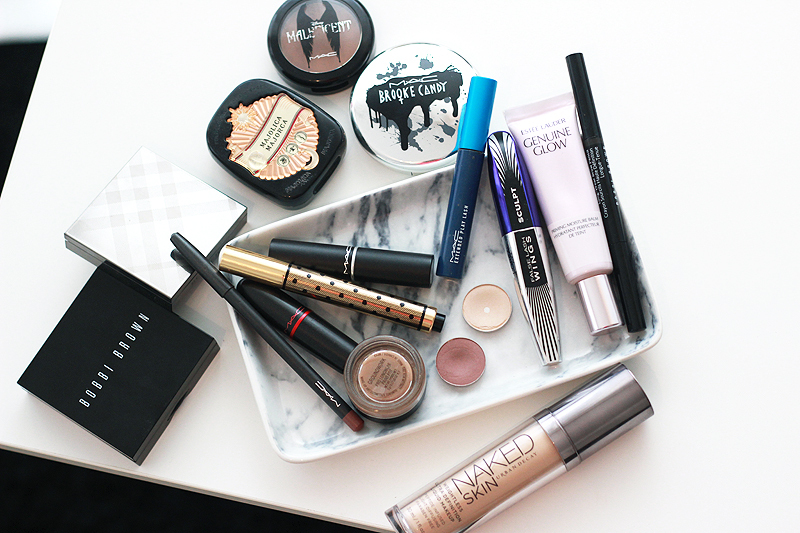 This routine takes me about 15 minutes in the morning whenever I'm not rushing. I like to pour myself a cup of coffee, put on my favourite morning radio show (hiya Grimmy on BBC Radio 1) and pick out my products for the day. I've also been downsizing my makeup "collection" as I notice that I often go back to the same products and am seriously neglecting some others. It's a work in progress!